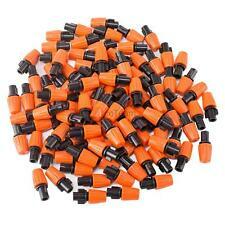 100pcs Garden Sprinkler Irrigation Adjustable Dripper Drip Single-head Sprinkler Heads. 100pcs x Adjustable Sprayer Dripper. Single-head sprayer. Adjustable water spray quantity, can be closed. Note: Note that when using a 4/7 hose, the effect of the spray is affected by the level of the family's water pressure. Description: 100% Brand new and high quality Widely used in nurseries, lawn, garden, Greenhouse ,poultry establishments 4 nozzle cross type Connection: id 4mm hose or make a dia 4mm hole on PE pipe Flow rate: 30-60L/Hour Pressure:150-300Kpa Spray dia: about 1.0 meters Material: Plastic Nozzle Color: Gray Quantity: 10pcs Included in the Package: >10 x Atomizing Sprinkler Brand Unbranded MPN Does Not Apply Model Sprinklers UPC Does not apply. Fix the misting hose by a cable belt saddle clamp. Turn on the water tap until the sprayer works and enjoy the cooling misting system. Close the water tap and install the last nozzle to the joint and use the end cap. Material: Plastic. Total length: 210mm. Brass Misting Nozzles for Cooling System 0.012" (0.3 mm) 10/24 UNC. 10/24 threads Misting Nozzles. 10×Brass Misting Nozzles. Sturdy brass body with stainless steel orifice. Material: Brass body,stainless steel orifice. 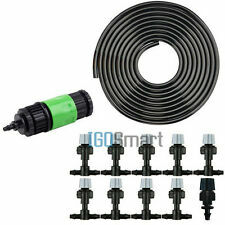 Description: 100% brand new and high quality Widely used in nurseries, poultry establishments Connection: id 4mm hose Flow rate: 8-10 L/Hour Pressure: 220-280Kpa Spray dia: about 1.0 meters Material: Plastic Color: Black & Gray Quantity: 10pcs Included in the Package: >10 x Atomizing Sprinkler Brand Unbranded MPN Does Not Apply Model Sprinklers UPC Does not apply. The nozzle, spray a larger range than the usual four-outlet spray nozzle,Atomized stronger. And each nozzle can be turned off individually,It is a better atomization nozzle. 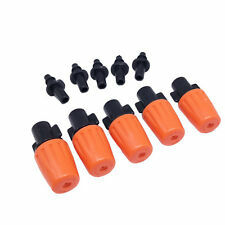 1 Mist Cooling Nozzle Set. Color: Gray. Connection: id 4mm hose. Pressure: 220-280Kpa / 1.5-3kg. Quantity: 10 pcs (10 x Nozzles 10 x Tees). Nozzle Color: Orange. Pressure: 220-280Kpa. Flow Rate: 2-2.5L/Hour. This Kit includes everything for a complete misting/fogging/cooling system. This system can be expanded for future growth, and the sprinklers are modular to allow for change if the application requires it.